Here they are, the most inspirational quotes ever uttered, sure to stir you and get you moving through the day. Whether you feel stuck or just need a good dose of inspiration from great minds, these should do the trick. Be sure to feed your brain inspiring quotes and phrases daily, since it needs to be fed regularly just like the rest of your body. 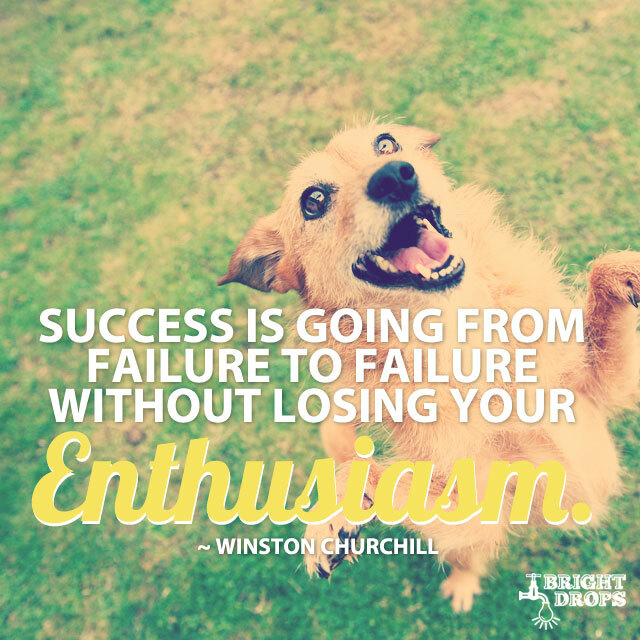 Getting knocked around by failures is never fun or easy, but this advice from Churchill reminds us that it’s vital that you remain enthusiastic when facing your next venture, or you can expect more of the same. It’s not an easy task, but it’s clear to see that if you let your defeats get you down you only make it harder to get that next success under your belt. Make an effort to get enthusiastic about your current endeavor, regardless of how many times you’ve fallen short in the past. This is sure to result in a success or two, which builds momentum and makes it easier to get excited about what you’ll do next. 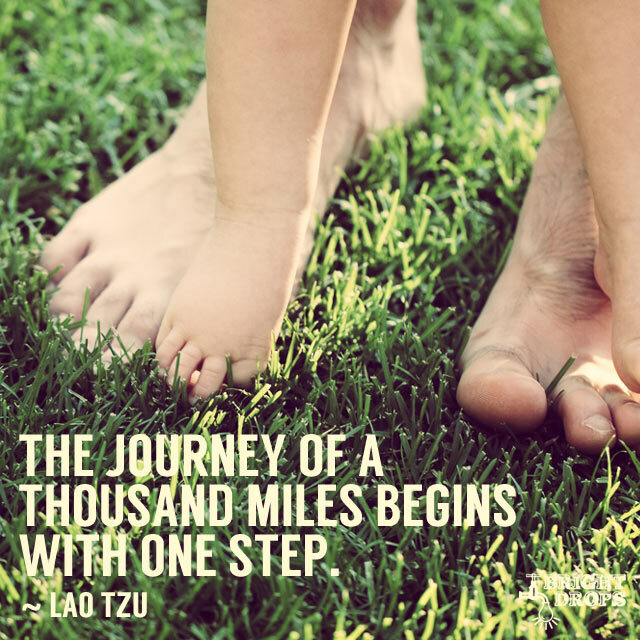 Each step you take toward a bigger goal might not seem like much. It may seem like you’re not really doing much at all. This will be especially true of any outside observers. Others might think you’re not getting anywhere, that you’re not getting anything done. That’s why you have to have a lot of confidence in where you’re going. You need to be clear about where you want to end up so that you have the conviction that the small steps you are taking will eventually get you to where you want to be, and you can squash any naysayers. Here’s a take on the “Actions speak louder than words. adage. It’s true that words can often be contradicted by the actions we take. This may be because words are easy to spew out, but you can only perform so many actions in a day. Actions must be more thought out and are a more accurate measure of what you really intend to do. Make sure to choose your actions wisely, as others will come to their conclusions about you based on what you do rather than what you say. 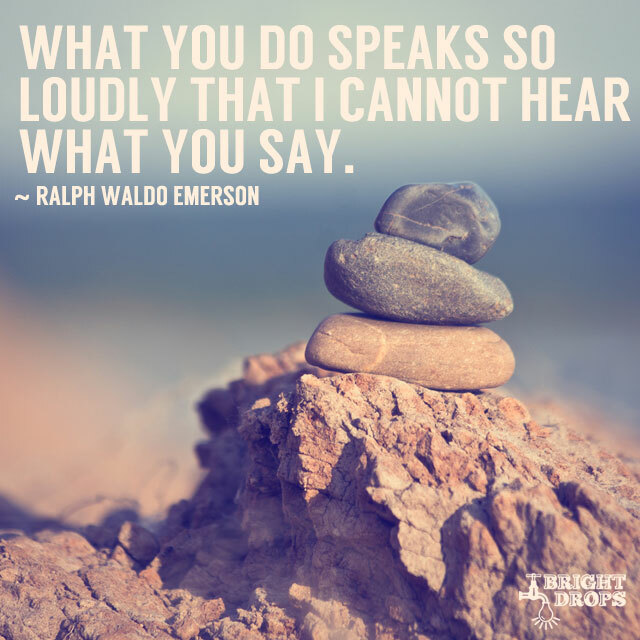 Many times there is a big discrepancy between what is said and what is done, which is why what you do matters more. It’s easy to get frustrated by all the violence and pain being experienced around the world, and even easier to feel helpless about it. But rather than sitting around waiting for the world to change, it’s better to start making changes within your own sphere of influence. The theory behind this quote is that if everyone tended to their own selves the world would be the way we all want it to be. 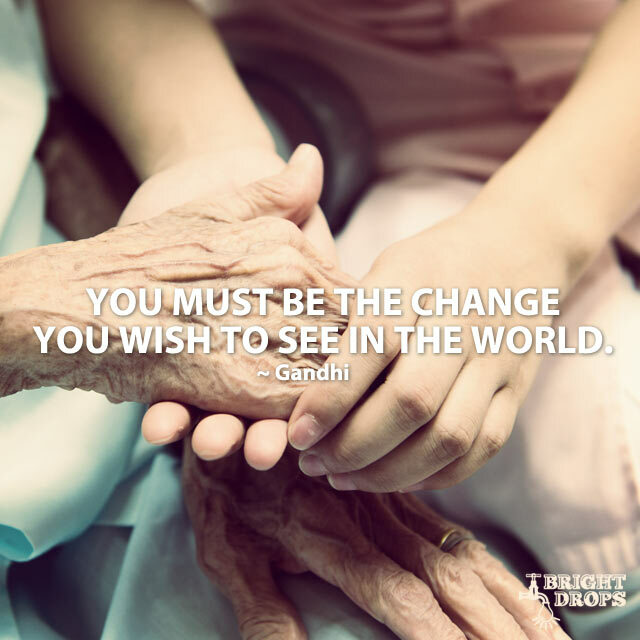 What can you do today that would help make the world around you a better place? By making the changes you wish the world would make you instantly and automatically make the world better. It’s true that even the toughest of times don’t last forever, and as long as you remain strong you’ll make it through and be able to weather whatever storms come your way. The human spirit has shown that it’s capable of making it through tough times, and getting to the end of the tunnel. 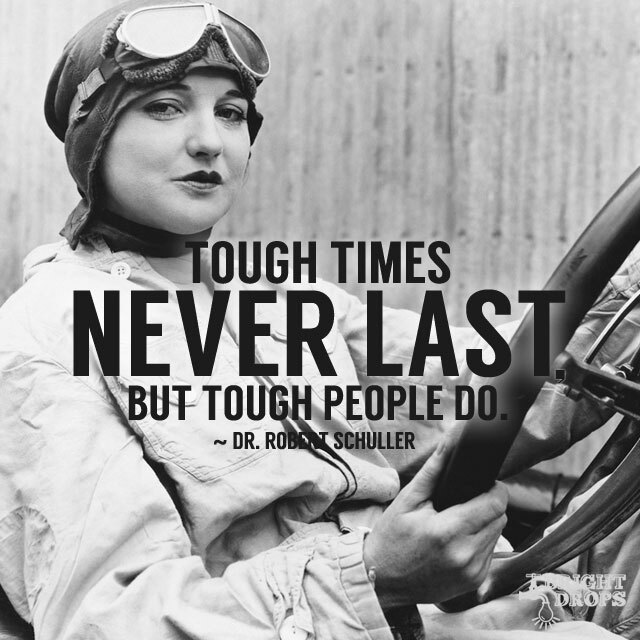 The best part of dealing with adversity is that it toughens you up for the next trial in your life. 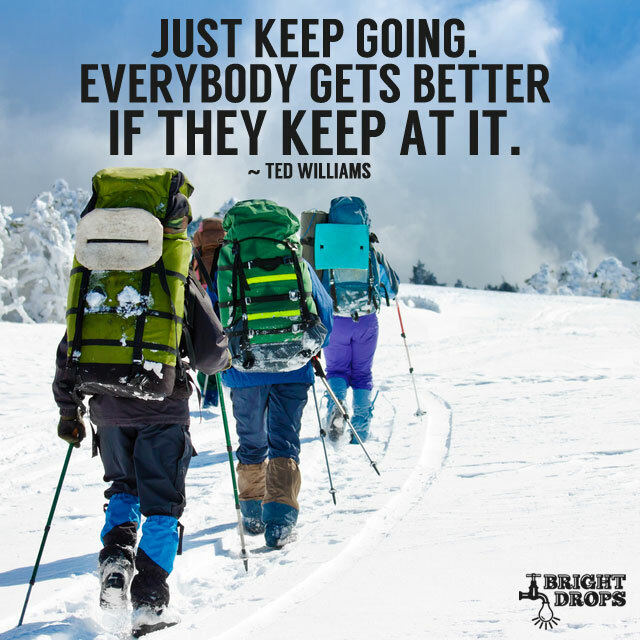 Knowing that you’re only getting better with each new struggle can be an inspiration during those times when you feel like giving up. Being a tough person doesn’t mean you have to be callous, it just means you have an inner strength that’s battle-tested. As long as you’re looking on the bright side of things you’ll be ignoring the not-so-good things in your life. What you give attention to grows, so if you’re focusing on what’s wrong in your life you’ll just get more of it to focus on. 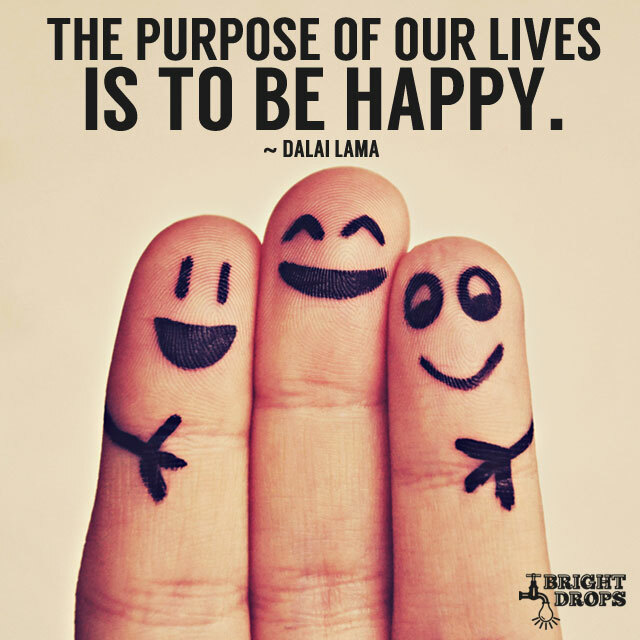 But if you focus on what’s right in your life, what makes you happy, what you’re grateful for, and why things are so fantastic for you, you’ll only get more of the same to be happy and grateful for. 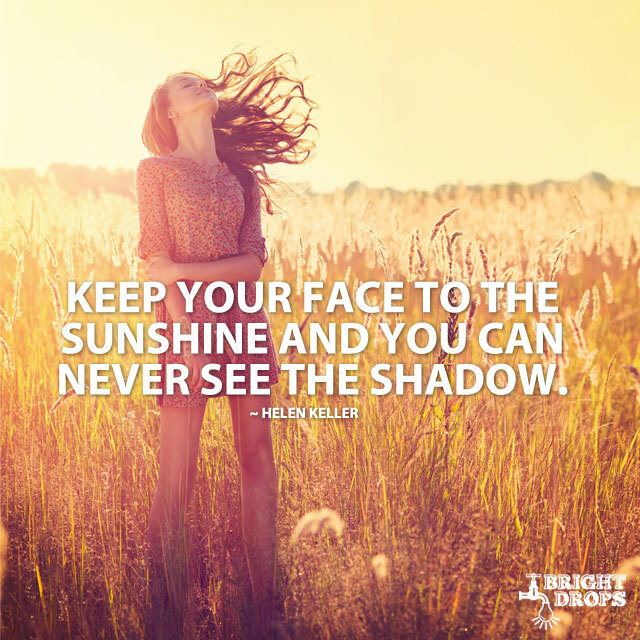 Some days are easier to face towards the sunshine than others, but it’s always there, you just have to try harder during hard times. If you’re in a tough spot it’s tempting to think of a clever way around it, but this serves as a reminder to just take the most direct route: through. You’ll find that a funny thing happens when you make up your mind to barrel through whatever dilemma you’re facing. Everything starts shifting when you stop hemming and hawing and finally decide to take actions to make your way through. It’s a way to get yourself on board with the idea of sticking it out and making it through, and when you stop the internal bickering you start to use your full potential to solve the problem at hand. 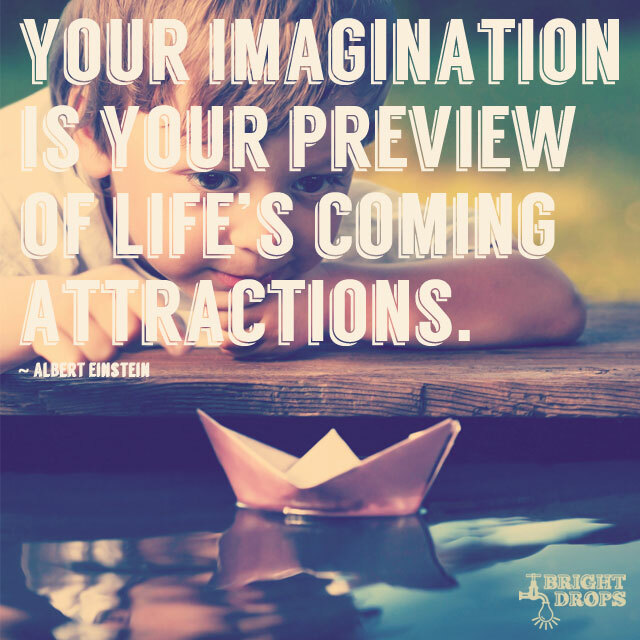 You use your imagination each day, even if you think you don’t. No matter how big or small your accomplishments today, it all began in your imagination. You can use it as much or as little as you want, but it’s the starting point for everything that happens in your life, from what you eat, to what you wear, to what you do. It all begins as pictures in your mind. 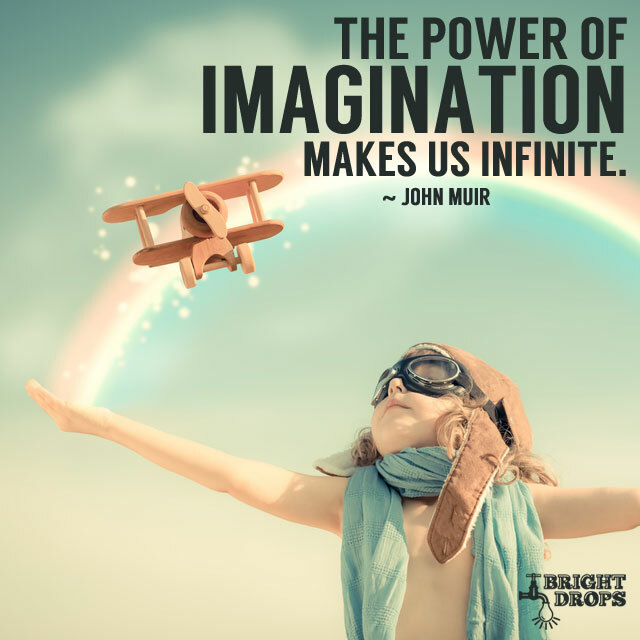 Be sure to harness the full power of your imagination to dream up bigger and better things for yourself. It’s the part of you that taps into the infiniteness of the universe, so don’t neglect it. It’s easy to lose sight of the importance of each day, because we seem to have so many of them. But it’s been said that a single day serves as a microcosm of your life, so be sure to spend your days in a way that embodies the way you want to live your life. At the end of it all your life will boil down to the accumulation of all of your days, and will serve as your masterpiece, so be sure to spend time each day chiseling the great sculpture that is your life. 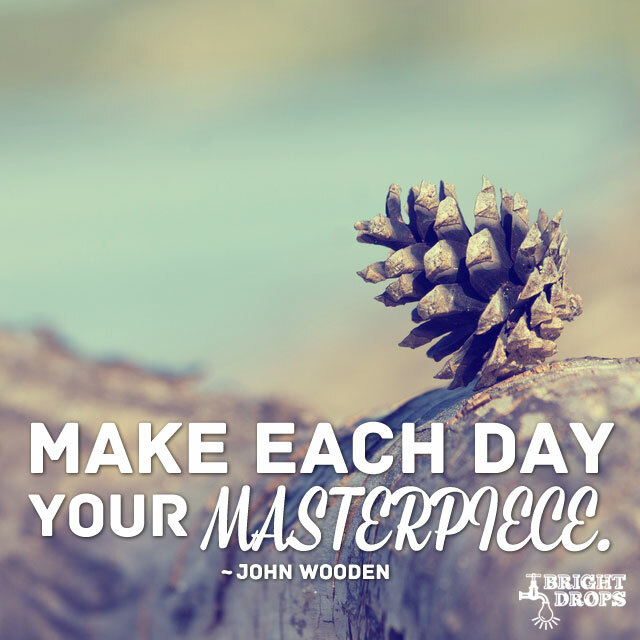 Treat each day the same, don’t write off days as being “bad, they still count towards the total work of art. Living a life that feels like a dream is the ultimate goal, isn’t it? You don’t want to save your best experiences for dreams experienced while you’re sleeping, because as tantalizing as they are they aren’t real. Having real moment in life that feel surreal and dreamlike is a wonderful thing to have, and the good news is that you can create this with focus and determination by making it your goal. Pick something you think would be a dream to be, do, or have, and then put all of your resources into attaining it. When you get there once you’ll be hooked, and you’ll want to move onto the next dreamlike moment. 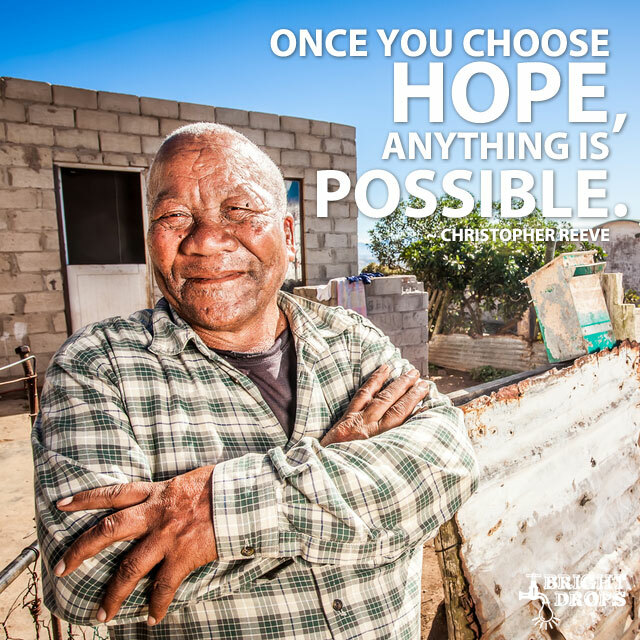 The opposite of this quote is also true, once you give up hope or choose hopelessness, nothing’s possible. Hope is the feeling that things will somehow get better, that they will somehow work out. You don’t even have to know how it will happen, but it’s the believe or even the wish that it will. That’s why it’s never a good idea to give up hope because you just don’t know how things will pan out. When going about your day it’s better to feel hopeful about the things you’re working on, or the task at hand. If you have hope, it’s quite possible that it can all turn out for the best. 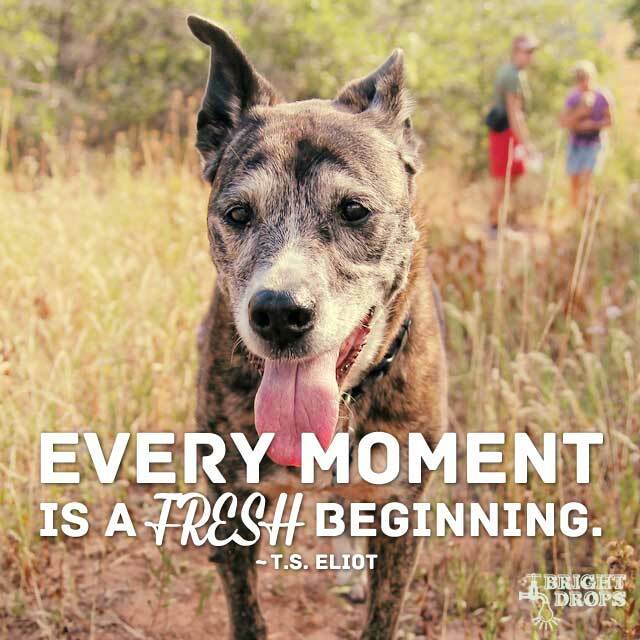 It’s interesting to think that you can start anew with each passing moment. You can let go of the past, let go of whatever is holding you back, and start again, doing whatever it is you want to do. It’s refreshing to know that the present is not entirely enmeshed in the past, and your future is being created moment by moment. If you’ve been mired in doubt and hesitation to start a new project or to mend a relationship because of things that have happened to you in the past, remember that this moment is totally new and you can move in the direction you want to go. 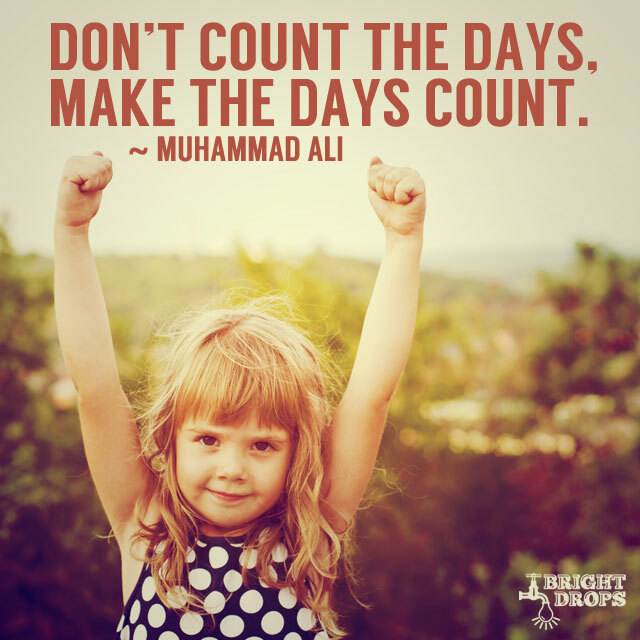 It can be dangerous to start counting down your days, because you want to make each one count. But many times there will be an event coming up that makes you start counting down how many days until it arrives. But each day between now and then is important, and you don’t want to breeze over any part of your life just to get to the next, seemingly better part. Putting the most of yourself into each day will make it so you never have any regrets about how you spent your time here, and you’ll know that you really did make it count each day. This is a cute way of pointing out the difference between what makes things extraordinary rather than ordinary. It really is a matter of a few degrees, going that little bit further to push things past the point of regularity. The key is that you want to always strive for the extraordinary. Doing a few extraordinary things might make you complacent, and ready to rest on your laurels. But then you run the risk of slipping back into ordinary behaviors. 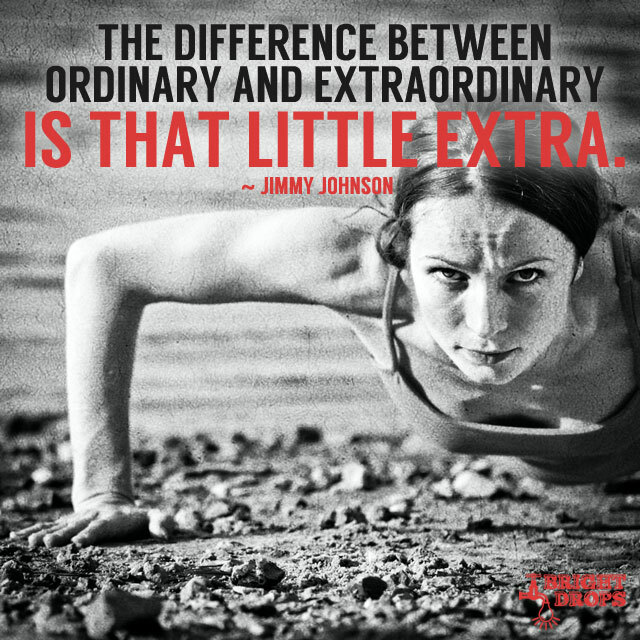 Always ask yourself if what you’re doing is ordinary or extraordinary and then give that little extra if needed. 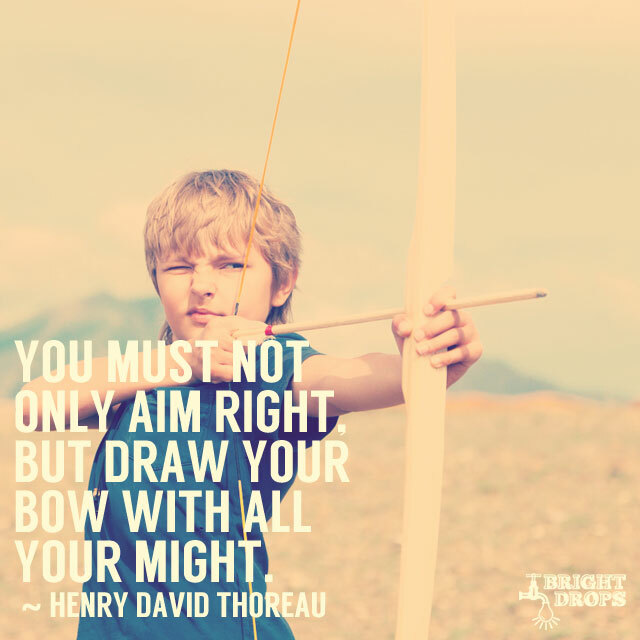 Thoreau points out that it’s not enough to get yourself focused in the right direction, but also to give as much effort as possible to propel yourself forward. The situation can arise where you know exactly where you want to go, but you just can’t muster up the motivation to build up the momentum to get you there. Another point to consider is that you can spend a lot of energy and give a lot of action, but if you’re not pointed in the right direction you won’t end up where you want to be. Both are necessary for true success and progress. 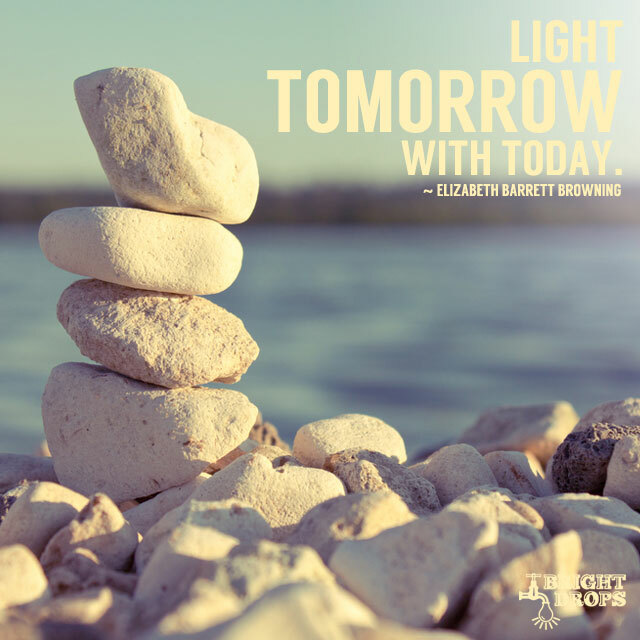 Today is your opportunity to make your tomorrow better. If you think of it from the point that your today is the result of your yesterdays, it’s clear that what you are doing today is either moving your forward or moving you backward. That’s why you want to grab today by the horns and make the most of it as you can. Do that enough times and you’ll start to see signs that your todays are getting better, which only sets you up better and better for tomorrow. You can find yourself in negative or positive spiral based on how well you are spending your days. It’s often hard just getting on the right track, but you have to remember that once you’re there it’s no place to idle. 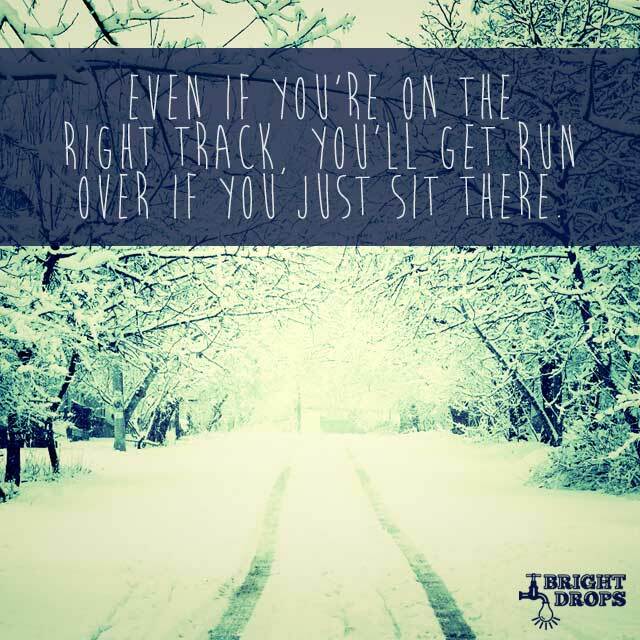 You’ve got to not only get on the right track, but move yourself forward along that track once you make it there. If it took you a long time to get on the right track, you may find it daunting to have to still give a strong effort to stay on it. But things get easier as you go along, and once you have the hang of it it’s easy to stay on the right track and keep the pace so you don’t get run over. Sounds easy enough, but it’s not our natural instinct. The natural instinct is to either get discouraged and give up, or ram up against the roadblock until we knock ourselves out. But what’s so bad about taking the long way around as long as you get to your final destination. 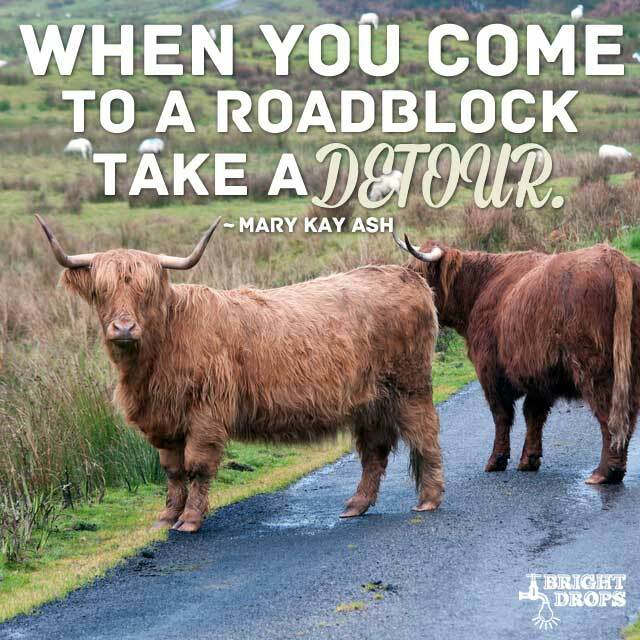 It does take a bit of belief that the detour is still leading you to where you want to go, and it takes mental fortitude to not get sidetracked along the way and lose sight of where you’re going. Once you remove time from the equation and give yourself room to breathe you can actually enjoy taking the scenic route to your goals and dreams. 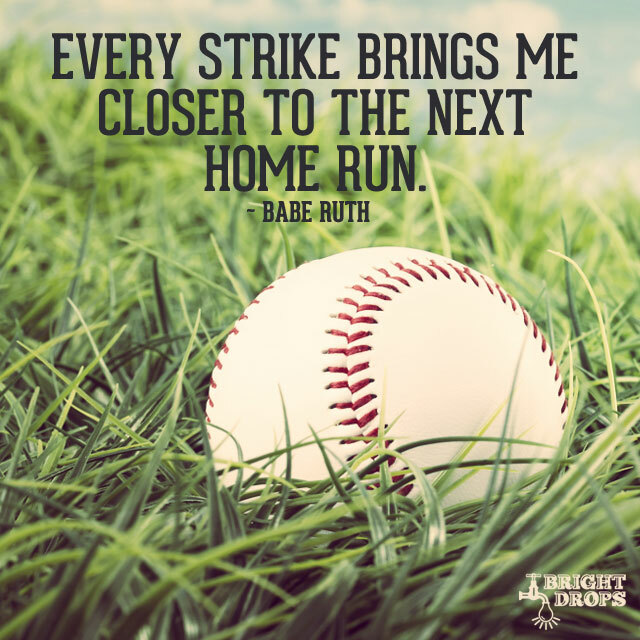 The Great Bambino struck out over a thousands times in his career, so he saw his fair share of swings and misses. But it mentality was right on. He knew that each time he got a strike, or swung and missed the ball, he was one step closer to knocking it out of the park. This is easy to apply in life rather than baseball, because if you’re swinging you’re trying, you’re attempting to get that hit. And with enough swings and adjustments you’ll eventually make contact and get that home run you’re wanting. You can never get a home run if you don’t swing at the ball. The power of belief can’t be overstated, and it’s summed up nicely here. Without belief you’ll never get there, so believing that you can is crucial to the process. Believing that you can do it summons the forces of the universe behind you to help you along. Doubting yourself and whether or not you can do it means that you’ll only give half-hearted effort, and you won’t be nearly as powerful as you could be. 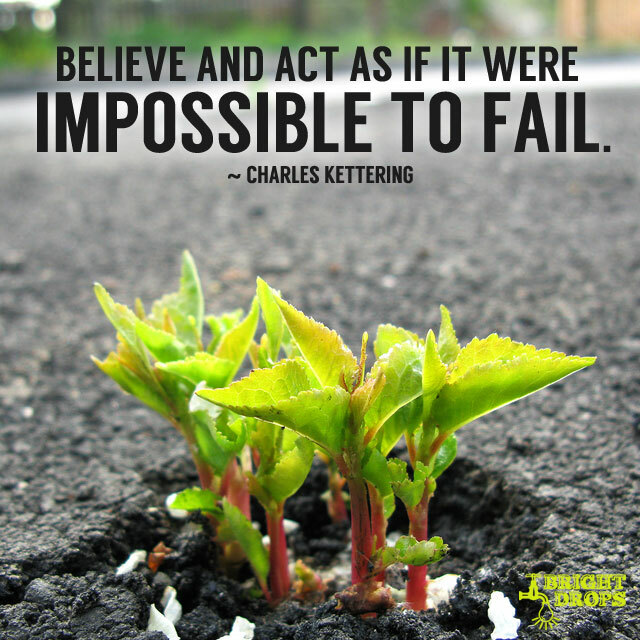 Belief can come with time, so don’t feel you have to believe you can do it all, just believe that you can accomplish the first step in getting there. It always seems like something’s just not right in order to start something new in your life. 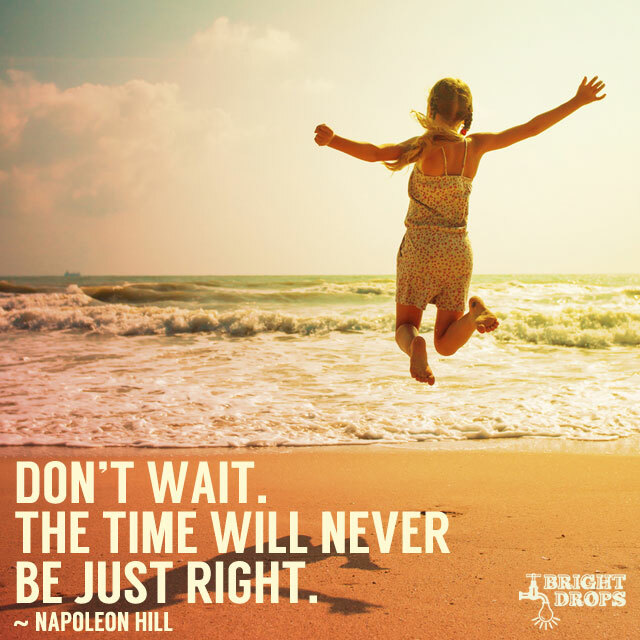 But the timing may never be perfect, you just have to get it started so that things can begin to develop. You make things right as you go along, and you tinker with the process to account for what’s not perfect. As things pick up steam and build momentum you’ll realize that the “just right thinking was just an excuse to delay the start or procrastinate. You’ll thank yourself for starting even though it seemed like it wasn’t the best time to do so. Imagine there’s a door marked Fear and behind that door is all of the things you’ve wished for all of your life. You try to open the door and it’s locked. 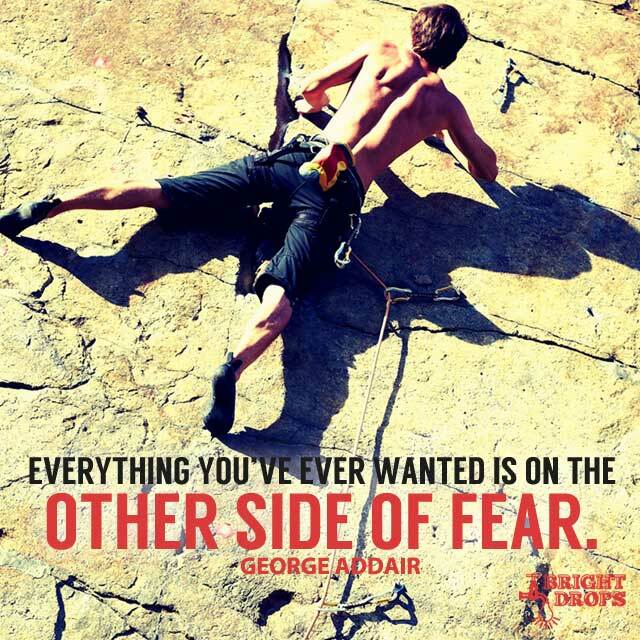 The key is overcoming that fear so that you can have the things you want and be the person you’ve always wanted to be. Fear is a tricky demon to exorcise. It’s different for each of us, and isn’t always a very strong feeling. It is sometimes a low-level vibration, that slight underlying feeling of dread that bubbles up when thinking of doing something new or venturing into the unknown. 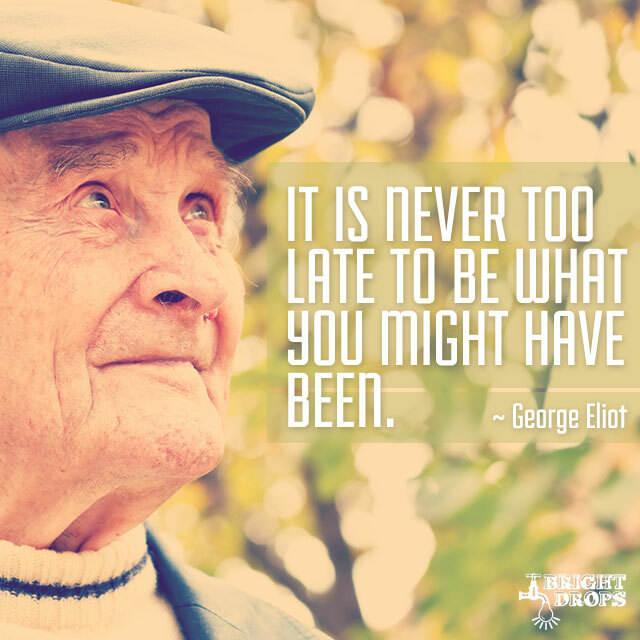 As long as you’re alive it’s not too late to become the person you really want to be. No matter how bad you might have screwed things up in the past, or no matter how far off course you’ve gotten from what you really want to do, you can always turn it around. It doesn’t take an overhaul in most cases. 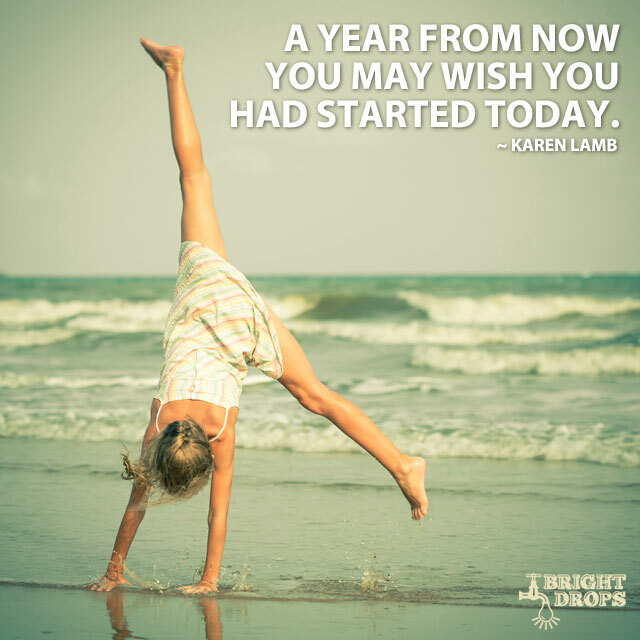 You can start taking steps towards being what you might have been today. Start implementing little actions into your daily routine to make up for the gap between where you are and where you want to be. 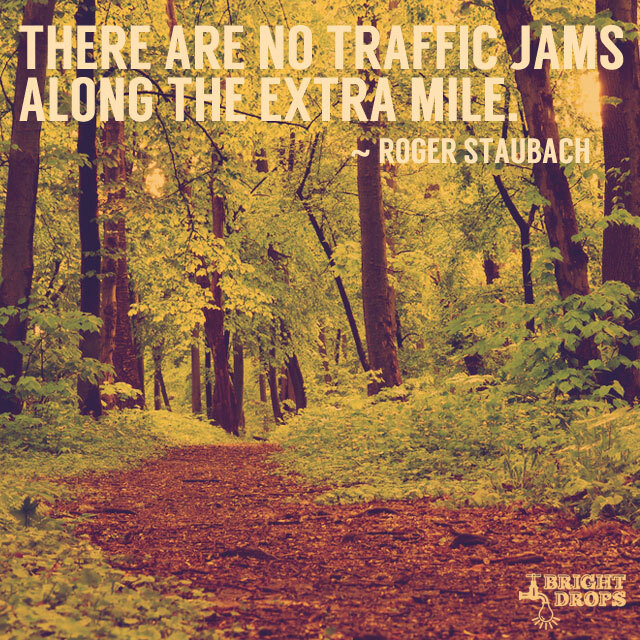 Not many people go the extra mile, which makes it easy for the rest of us to get to where we want to go. They say it’s lonely at the top, and this is because few people ever make it that far. Going the extra mile is part of that process, and it’s a habit you can start getting into right away if it’s not currently a part of your makeup. Try it out on a small scale in your personal relationships, or at your current job. As you make it a habit you’ll notice more and more opportunities to go above and beyond, and you’ll be able to accomplish more and more. This is a great way to look around you and see what it is you can do with the resources you have on hand right now. Don’t say things like “if only I had this… or “I need to do that before I can do that… as these are just clever ways of putting things of to a future point that never comes. 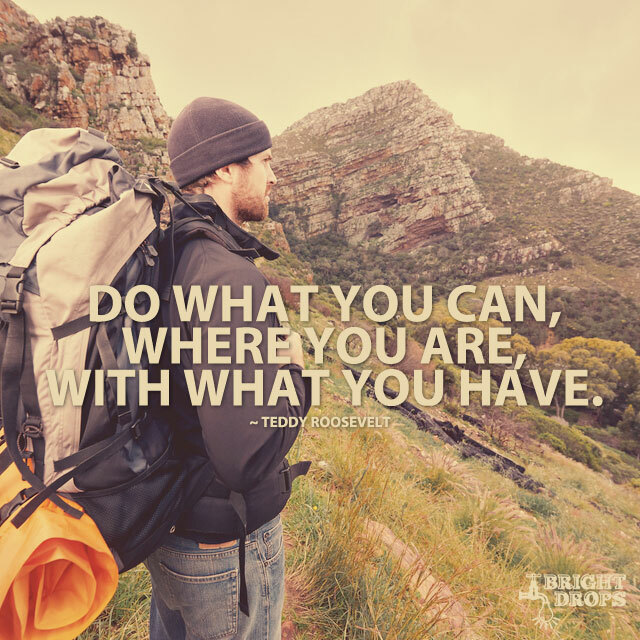 The fact is there are things you could be doing right now that will further your endeavors. Work on those and everything will start to fall in place, you’ll be where you need to be, and you’ll have what you need to have to get bigger things done. It’s often enticing to dream of Easy Street as having finally made it. But Madden reminds that it’s no picnic getting there, and you have to pay your dues. Things do become easier, but you may have to put up with a lot of stinky situations before getting there. 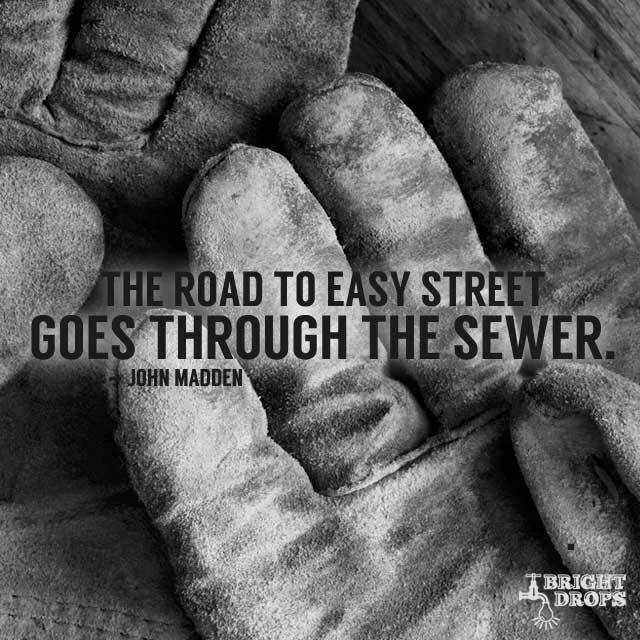 Most people will give up before getting there, and spend too much time in the sewer, thinking that Easy Street is just a pipe dream. But the unpleasant parts are just a way of weeding out those that really want the prize from those that only talk about wanting it. Struggle often feels like a lack of progress, so it’s nice to turn it on its head and realize that it’s actually the way progress is made. If you’re not struggling you’re probably not challenging yourself enough. 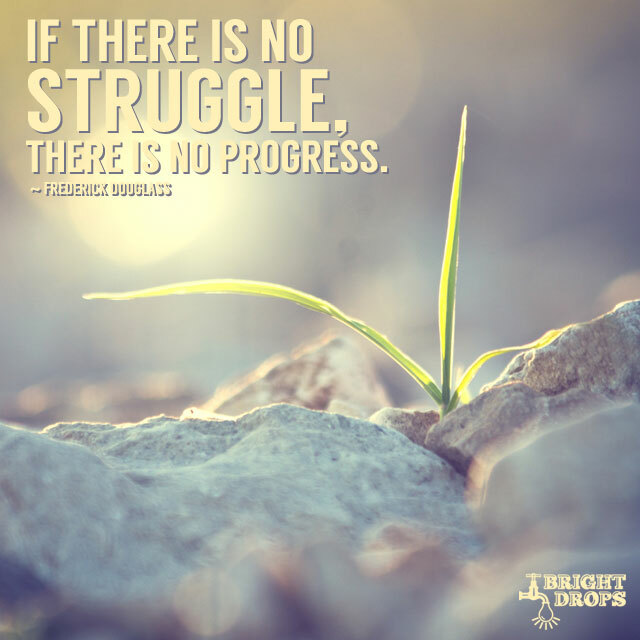 The important part is not to let struggle deter you from making that progress. Step one is learning to view struggling as a positive thing, rather than a negative thing. Then you won’t be so hard on yourself if you find that you’re struggling again. It just means you’re learning, growing, and taking on enough to keep you busy. You can use your fear to point you in the direction of what is most important to you, rather than be hard on yourself for feeling fear in the first place. If you aren’t afraid of doing something, it generally means you don’t find it very important, or you wouldn’t have that fear. 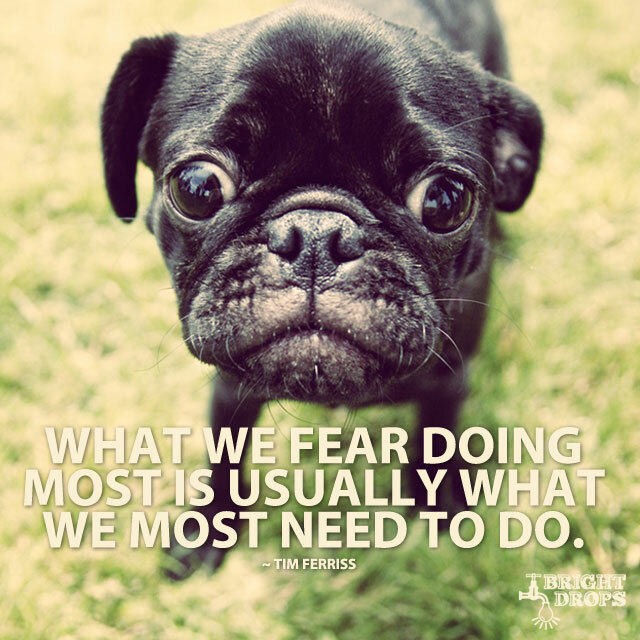 In this way fear can help us drill down to the things that we simply must do. Part of that is going to entail getting over that fear, or learning to live with it so that you can still get the things done that need getting done. 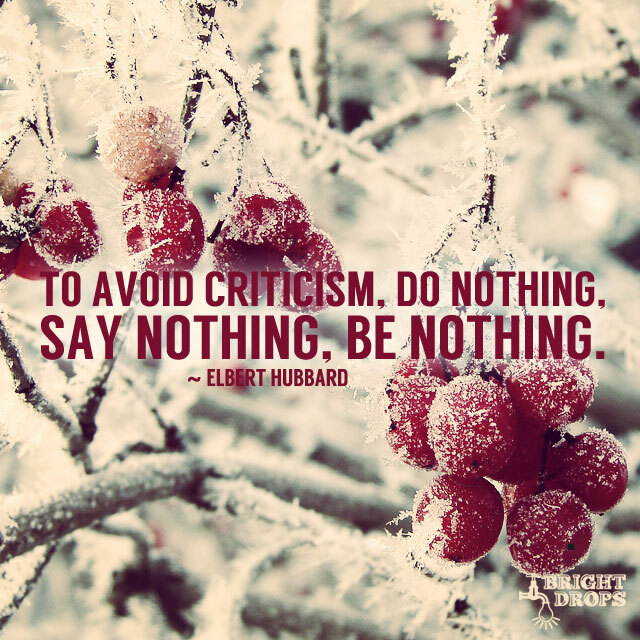 It’s easy enough to get people to criticize you, just try something, say something, or be something. Most are at home criticizing what others do and say without offering their own opinions or actions. That’s why it’s silly to worry about getting criticized. What you should really worry about is not being criticized, because that means you’re not putting enough of yourself out there to face the criticism. Over time you’ll be able to brush off criticism that has no merit, and learn from the criticism which can help you grow. It’s hard at first, because your feelings might get hurt from the initial onslaught, but it does get easier. Work can be miserable and tedious, or it can be a task you look forward to accomplishing each day. The choice is yours, and if you want to shift your thinking on it, try to develop a strong desire to get it done. This will make it seem more like a game than work, and will give you a strong sense of accomplishment when the day’s tasks are complete. You may even feel like you didn’t really do any work, because you really wanted to get it done. 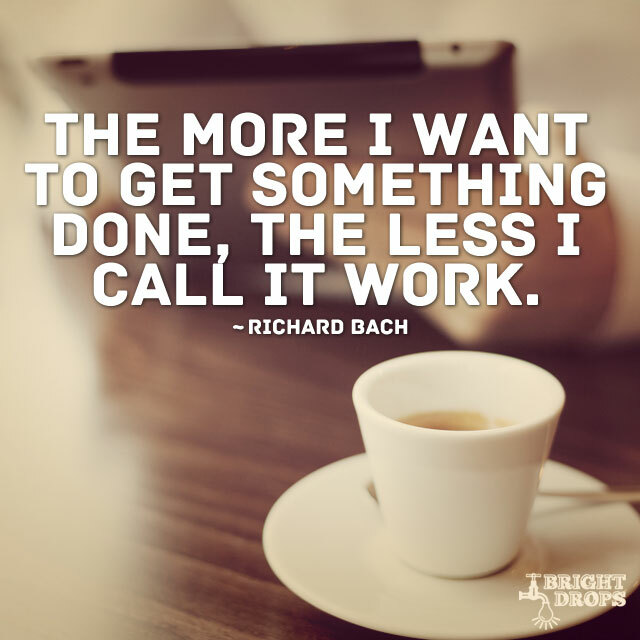 Trudging along doing work that you don’t particularly like can be stifling, so work on wanting to get it done. If you like watching movie previews before a film, you may like the idea of your imagination acting as your own sneak peek of what to expect. 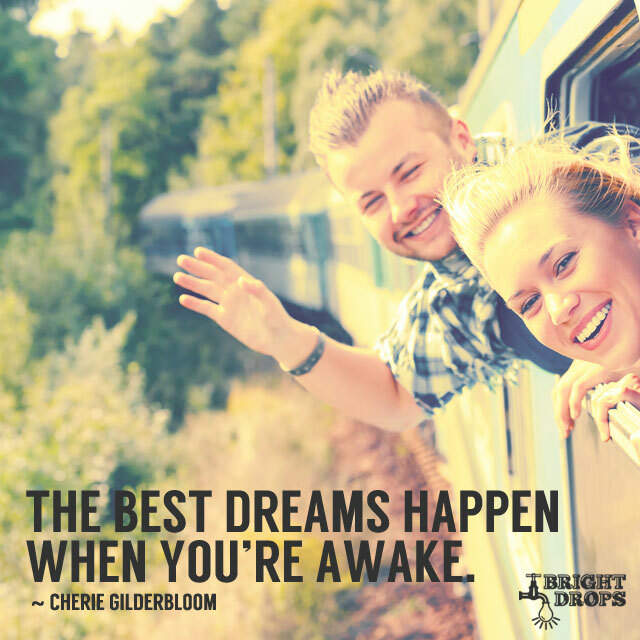 That’s because you dream it up in your brain first before it happens. This can work to your benefit, but also to your detriment, so be sure to use it advantageously and imagine your life the way you want it, rather than the way you don’t want it. If you aren’t actively using your imagination you’ll grow stagnant, and you’ll notice that your life hasn’t really been improving or worsening, just kind of hovering in the same spot. They say you should think of what you want to do when you retire, and start doing it now. 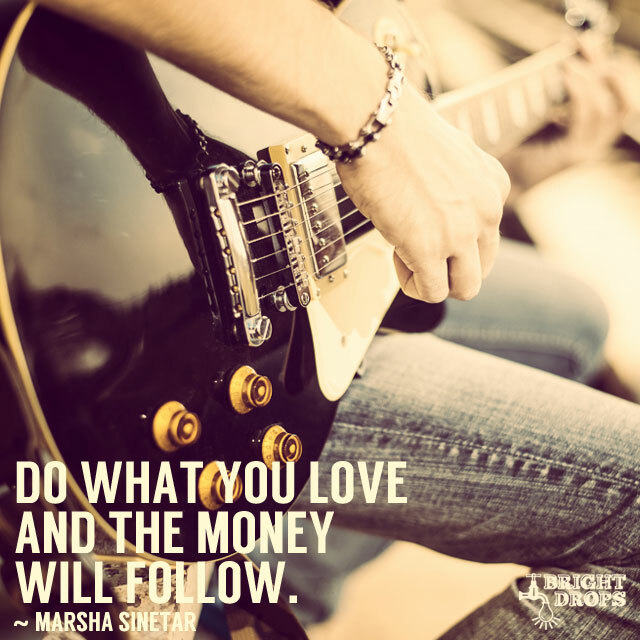 That way you’ll know that you’re doing something you love, and if you do that long enough you should be able to start charging for it. Going after the money is not a good method because you’ll typically end up doing work you don’t really enjoy just for a paycheck. If you’re stuck at a job you don’t like make sure that you’re doing what you love in your free time so you can eventually replace that income. 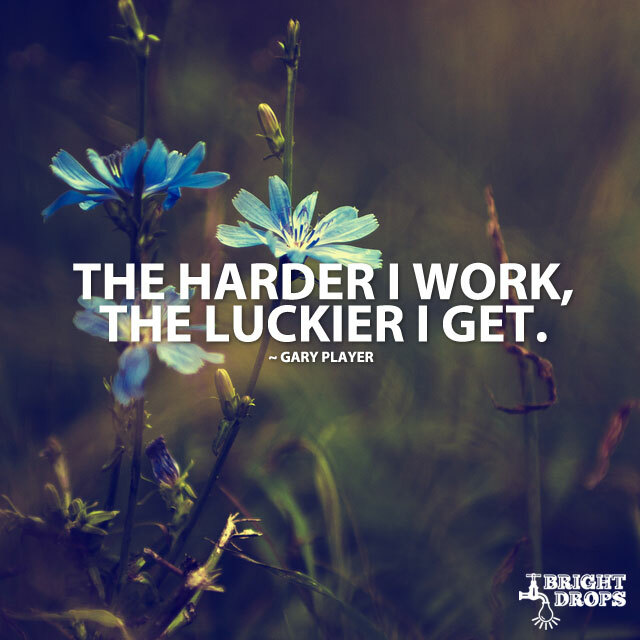 It’s easy to equate success with luck, but that is often not the case, and those that are seemingly lucky have put in the hard work to get that way. Luck has been described as the moment when preparation meets opportunity, so you have to put in the work to get prepared for the time when opportunity comes knocking. You may have opportunities presented to you but you are not prepared to capitalize on them, and therefore cannot take advantage of that lucky moment. Put in the work and the opportunities will come and you’ll be ready for them. 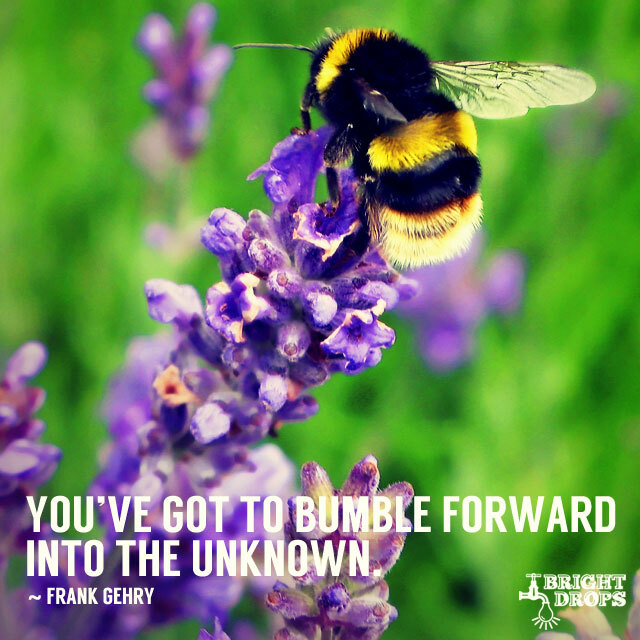 The unknown is a scary place, which is why so many stay in their comfort zones. But the unknown is also where all of the fun things in life are created. 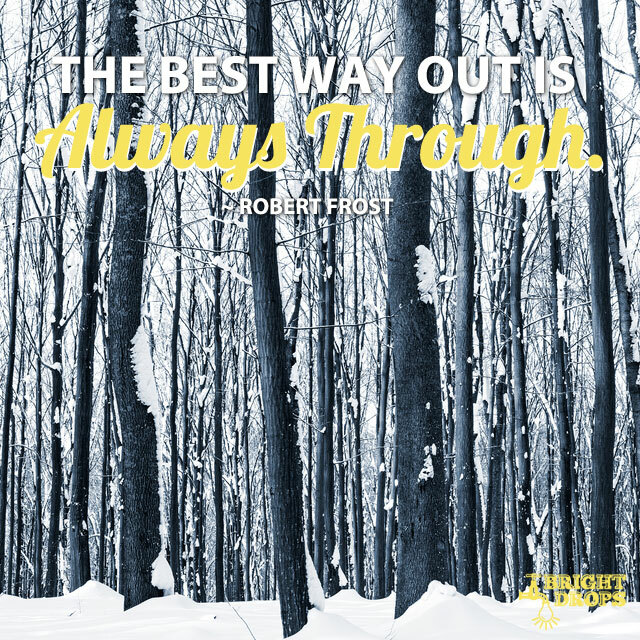 You have to venture forth, and this quote reminds us that it doesn’t have to be pretty when it happens. Bumbling and stumbling is fine as long as you are leaving the familiar behind and pushing forward. You may stub your toe or bump into things, but it’s better than remaining still and staying in your safe places. The better you get at being comfortable with the unknown, the more successful you should become. Here’s some reassurance that falling flat on your face is not the end of the world. It still represents forward progress, even though you won’t get any style points. It’s a reminder that you won’t always have the proper footing, and that you can recover from any mishap as long as you continue onward. Often it seems that to make progress in our lives we have to be perfect and unerring. But the reality is that the fear of making a mistake can leave us frozen and not moving forward. 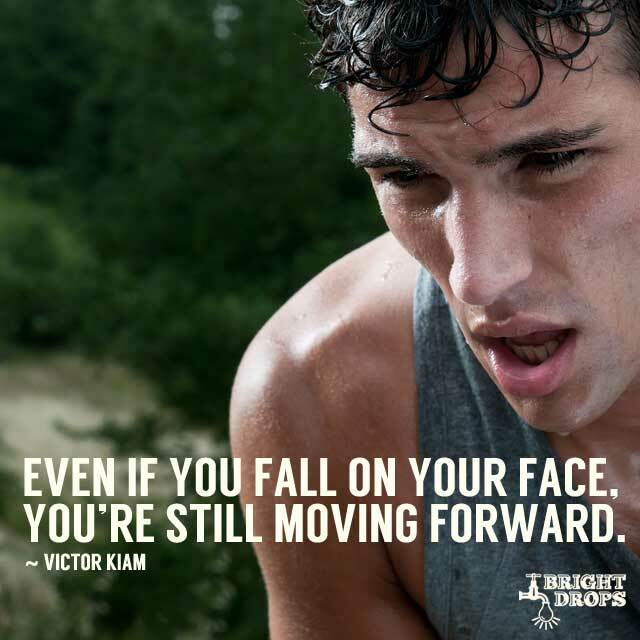 It’s better to lunge forward and risk falling down than not move at all. The Dalai Lama has a way of saying things that makes it very hard to argue. It can’t be stated any plainer than this, and it’s easy enough to see if you’re currently living out your life’s purpose or not. It also makes it clear which things serve your purpose, and which take away from it. If you’ve been pondering your purpose lately, this is a quick way to get grounded again, and to take an inventory of what’s working and what’s not in your life. You may find another purpose for your life, but underneath it all is this deeper underlying purpose. 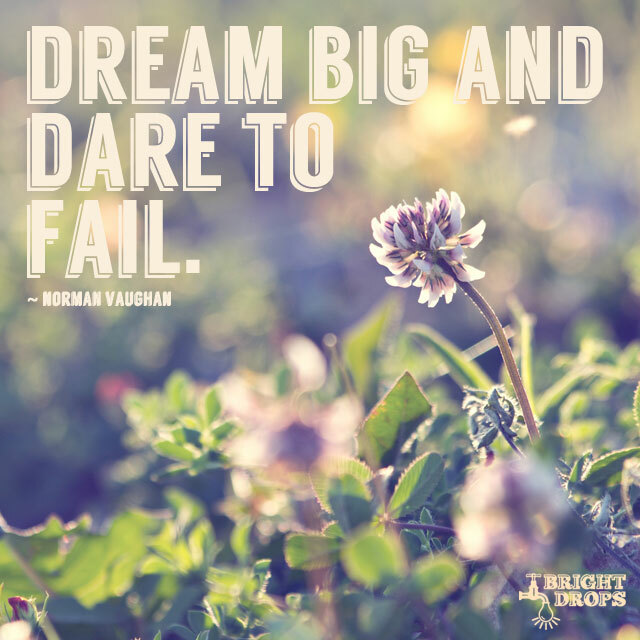 Those that dare to dream move the world forward. Everything that’s ever been accomplished by mankind started off as a dream in someone’s mind before it became a reality. That includes the city and country you live in, the house where you reside, and the car that you drive. 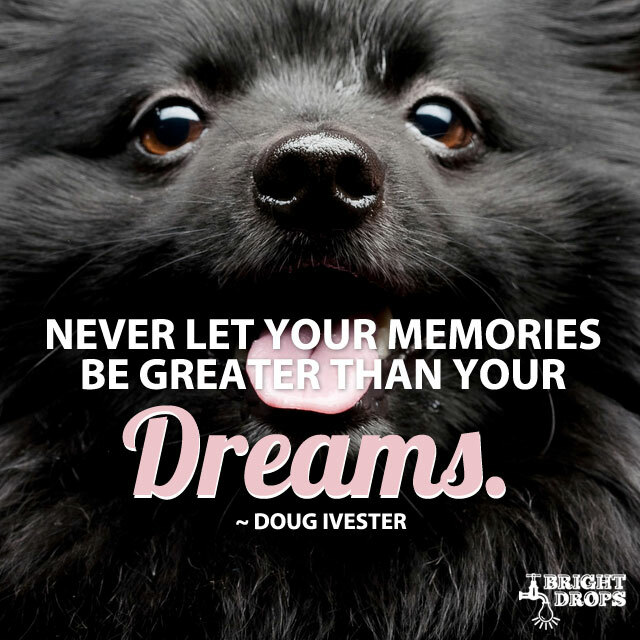 It’s all thanks to the dreamers out there, and you can be one of them, just as long as you make it a priority to dream and then carry out the visions of your dreams. The real saviors are those that dream and then follow through on their dreams with inspired action. This is true and gives new meaning to the phrase time is money. The reason people have so much emotion wrapped up in money is the time it takes to attain it. 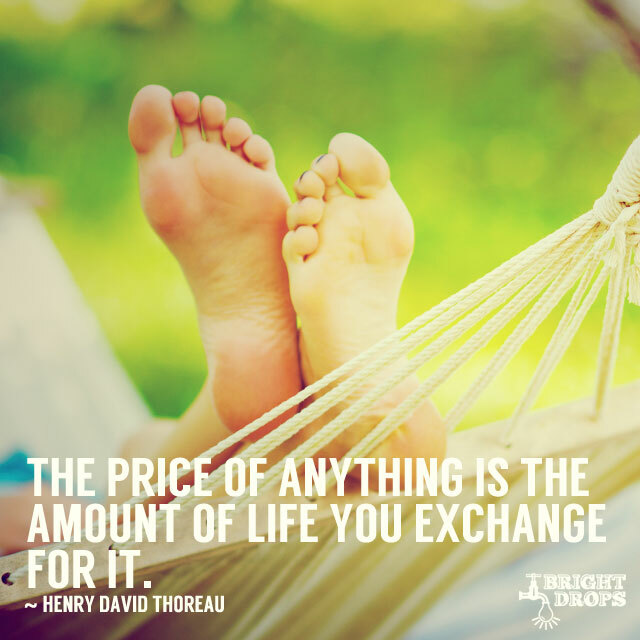 When you buy something and exchange money for it, what you’re really exchanging is the time it took you to earn the money, so your time is what really paid for everything you have in your life. Looking at money as your life energy will either make you feel better about it, or worse, depending on how much you have and how hard you feel you’ve worked to obtain it. 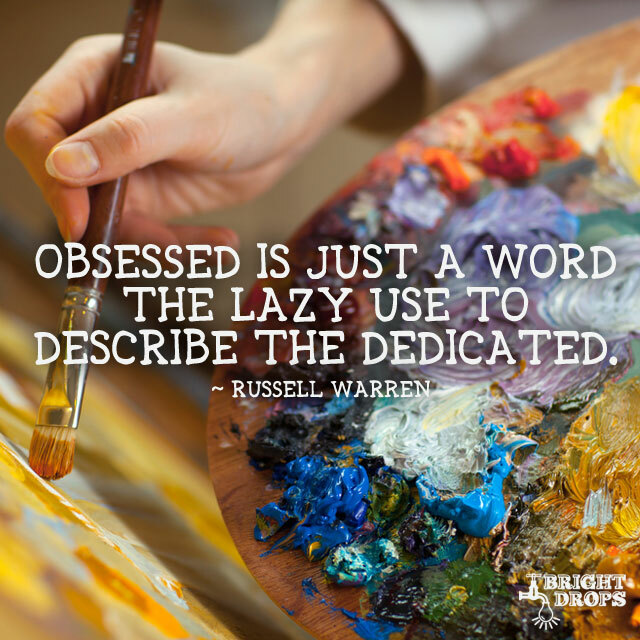 If you’re dedicated to your work and forego other activities in order to see it through you may be dubbed obsessed by those that don’t have as much passion for what they’re doing. You may be referred to as a Mad Scientist while you toil away, but when you have your vision locked into achieving your goals and dreams, everything else has a way of fading into the background. If you’re truly interested in seeing yourself succeed it’s good to become obsessed with it, because the more you think about something the more likely it is that it will come to you. 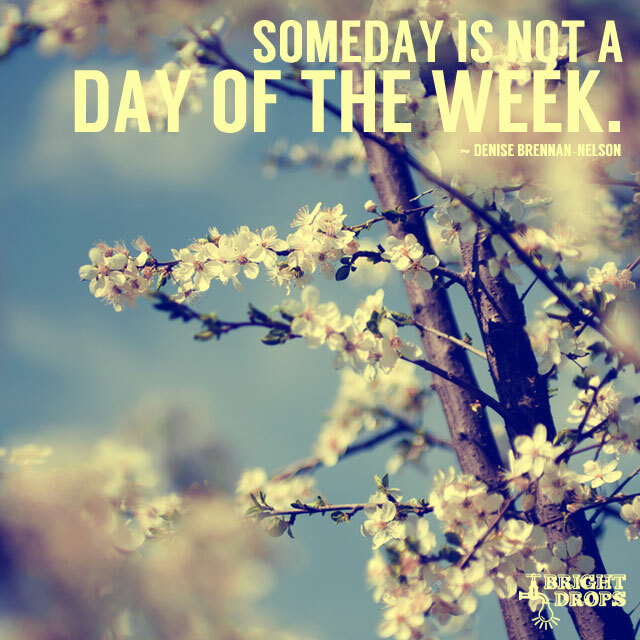 We’ve all heard that someday never comes, but it’s just too effortless to push things back to that very vague “someday. It’s a way of rationalizing that you might do something, or might get something one day, just not today. But the reality is that it’s probably not going to happen, you just can’t bear the thought of it not happening. It’s hard to monitor yourself for this type of thinking, but you’ll want to do your best to eradicate it from your mind. If it’s really important to you, set a deadline for it or you probably won’t ever end up getting it done. 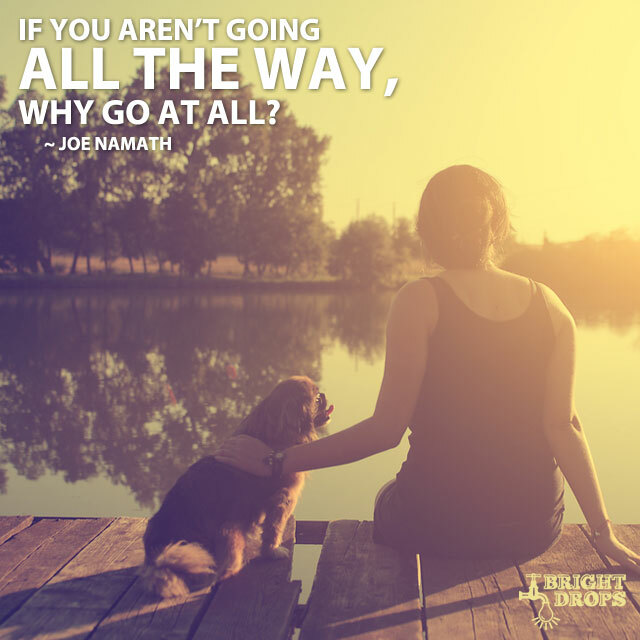 These days it seems like everyone is trying to get there faster than everywhere else, but what’s the rush? 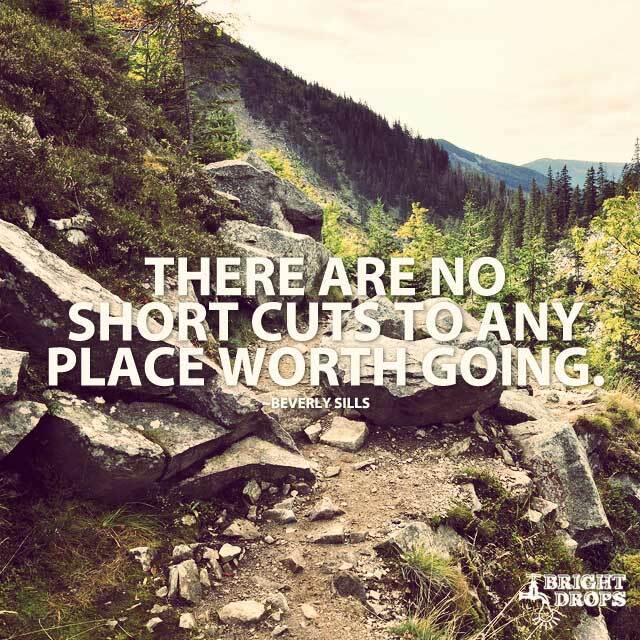 If it’s something worthwhile it’s worth doing it right and enjoying the journey along the way. If you take a shortcut you miss out on the full experience, and you miss the point. Don’t be afraid to put in the time it takes to get to where you want to go. If you stop looking for a shortcut and spend that time going down the right path, you’ll get there right when it’s the perfect time for you. There will be times in your life when you’re outmatched. There will always be someone better out there, but that just means you have to find other ways to beat them. The one thing you have control of is your own work ethic. 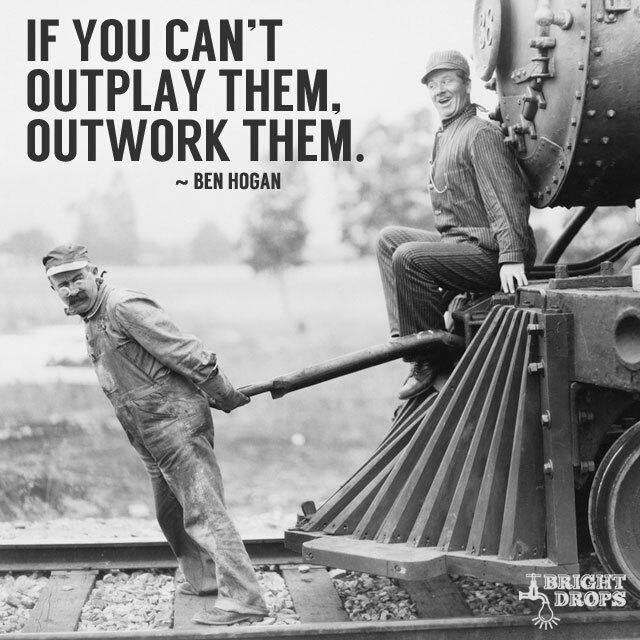 You can be sure to outwork them by giving it more than they will or are able to. This extra work translates to a better ability the next time you’re matched up against them, shifting the odds of winning to your favor. So remember, all is not lost when you find yourself outplayed, you just have to remember to put in the extra work to pull off the victory. This is a slight twist on the more familiar quote which states the best way is to create it. What would you expect from an inventor but to adjust it accordingly. 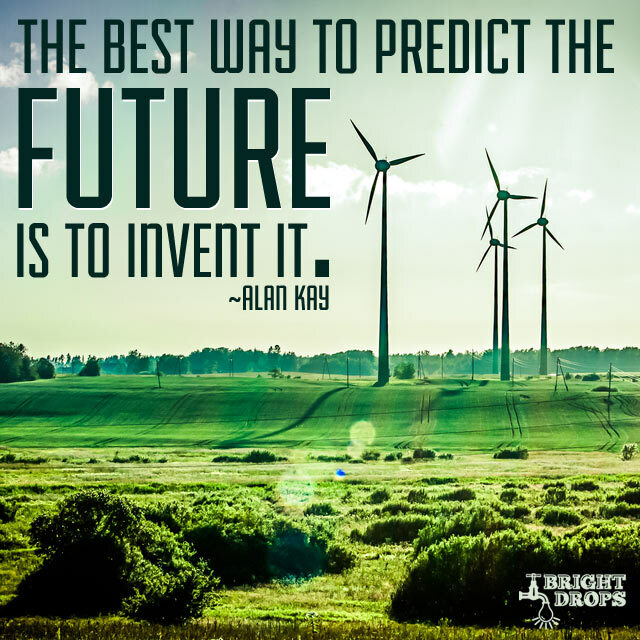 It’s true that the future does not yet exist, so it’s possible to come up with a version of it that suits you best. Either way, you’re going to invent your future, so put your best efforts into creating the future you want, rather than one you won’t be happy with. Just be sure not to spend so much time pondering your future that you miss the present moment where life actually takes place. Think of how many people quit playing before they become a champion. Perhaps they might have made it if they just would have kept playing, making adjustments, and getting better at their craft. If you want to experience more success all you have to do is keep practicing, keep playing against better opponents, and keep learning all that you can. With enough perseverance you’ll find that you become a champion because you’ve spent time “in the trenches and now you know your game better than anyone else and you are dubbed a champion. This is not just applicable to sports, but to several areas of personal development. 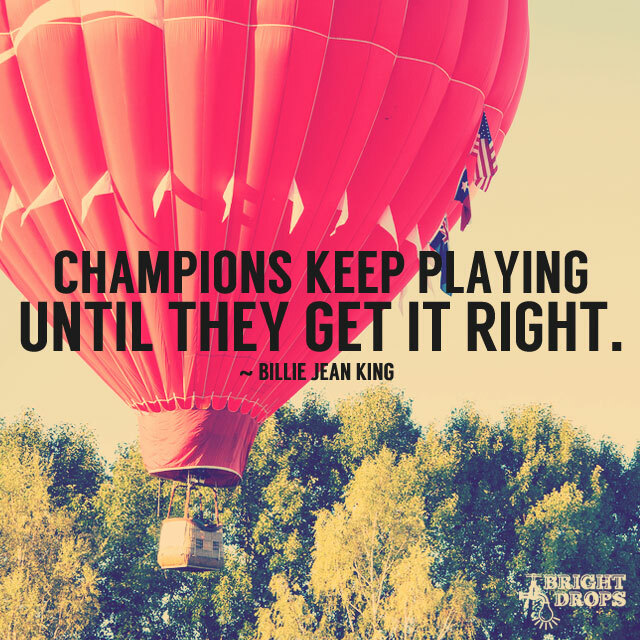 Which areas of your life do you want to become a champion in? 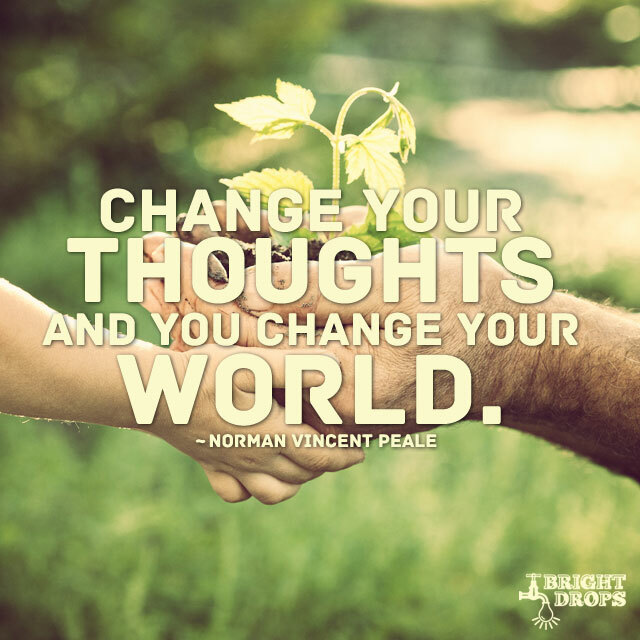 It seems like it would be easy enough to change your world if all it takes is changing your thoughts, but thoughts aren’t the easiest thing in the world to change. Many of the thoughts a person has each day are the result of habitual thinking, thinking the same thoughts again and again, day after day. It takes work to try and undo this sort of thinking and have new thoughts. But if you can manage to think more positive thoughts, your world will become more positive. The opposite is also true, which is why you should pay attention to the way your thoughts make you feel. Giving it your all is hard enough, but when the odds are stacked against you it becomes very tempting to just pack it up and go home. 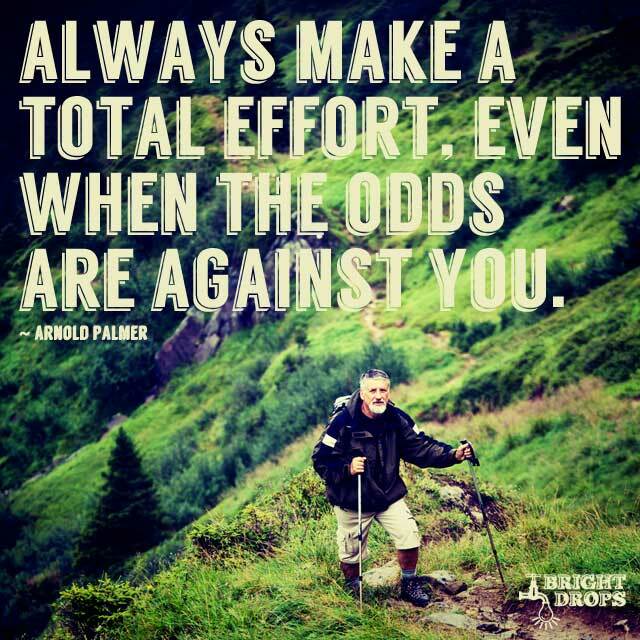 But if the odds aren’t in your favor you have to give it as much effort as you possibly can if you hope to come out on top. 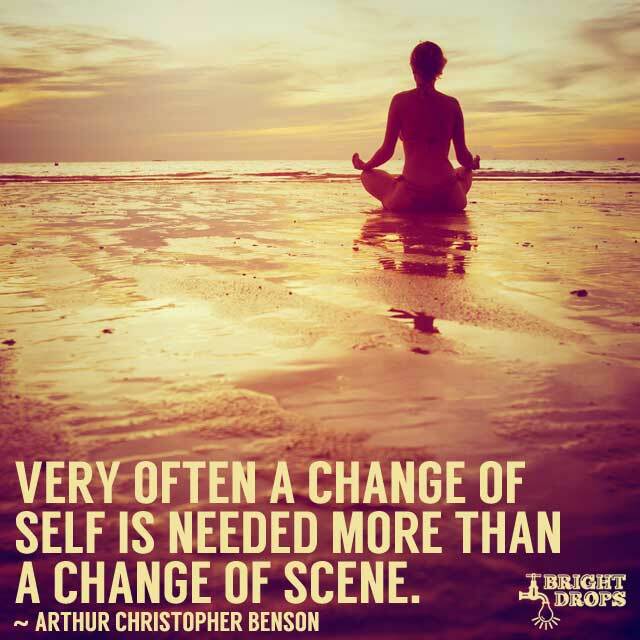 Only you know if you’re giving your full effort, so this becomes a battle with yourself more than anything else. 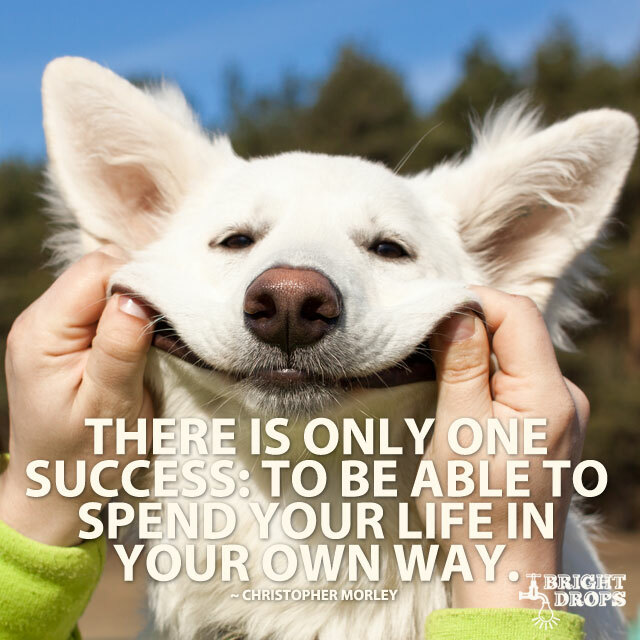 Learning to get the most out of yourself is a trick that the most successful achievers have mastered. This is an interesting concept to grasp, since many of us long for feeling like we have everything under control. But if that’s the case then it means you’re not getting as much done as you could. If you can reach a point where you feel comfortable with things being a little out of control you’ll be able to get more done and have a fuller experience. 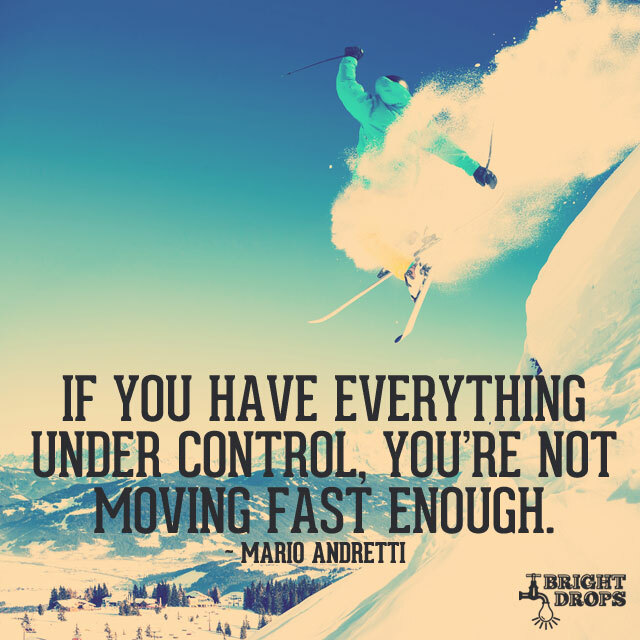 Leave it to a race car driver to come up with a quote about speed, but this is easily applicable to everyday life, by taking a look at how many balls you’re juggling and whether you feel challenged enough. Be able to give up some control in order to push your boundaries. 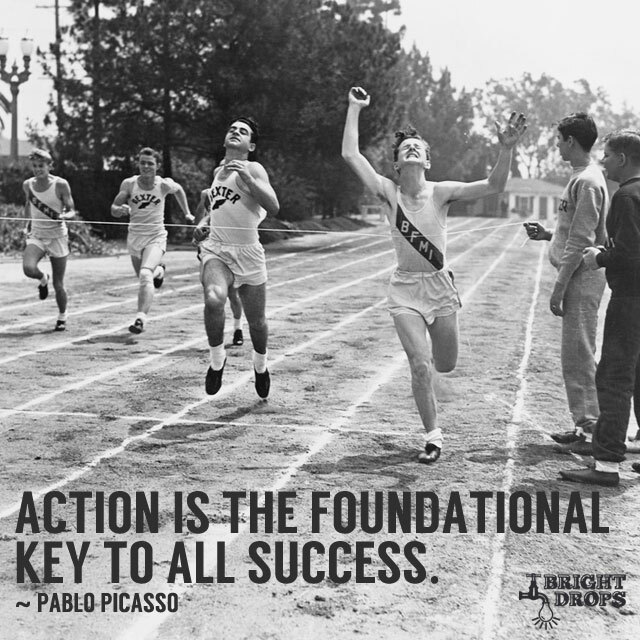 Without action nothing gets done. The key is not doing action for the sake of action, but taking inspired action that is in line with your bigger picture. Many people stay “busy all day, but don’t really get a lot accomplished. The difference between being busy and taking inspired action is great. You rarely feel flustered or overwhelmed when you are taking action based on a strong desire to reach your goals. But it’s easy to feel frustrated and frantic when you are just completing actions in order to have something to do. Time moves in one direction, and your life should be moving in that same direction if you want to have the most satisfaction from it. Forward is the only way to go, it’s the direction of life. If you’re not moving forward, growing, expanding, taking on new challenges, you’re moving backward, shrinking, atrophying, and eventually dying. Don’t send yourself to an early grave, keep your eyes forward and your mind active so that you can keep moving in the direction of life, growth, and fun. 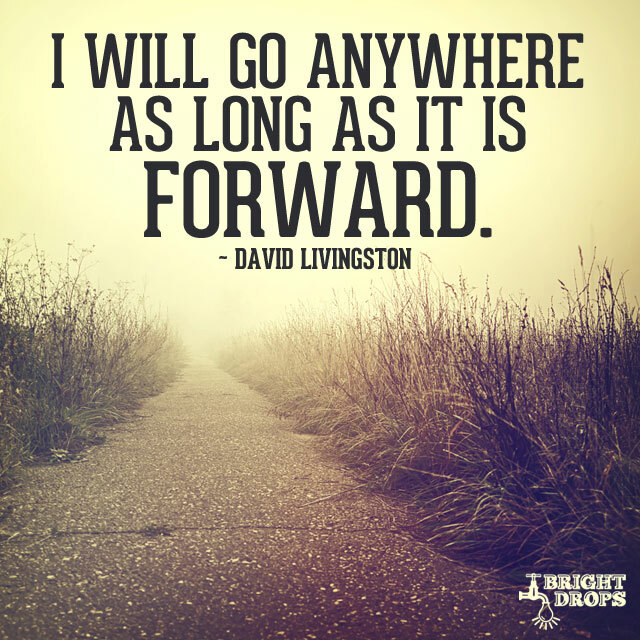 It doesn’t really matter which destination you end up in, as long as it represents forward progress in your life. The goal is getting there, and if you don’t plan on going all the way in order to get there, it’s best not to start the journey in the first place. It’s possible to start a new project in your life, get halfway there, and then stop. But the rewards come at the end, and if you didn’t commit to going all the way, giving it everything you have, and sticking it out until the end, why bother starting in the first place. The point he seems to be trying to make is that at one point you wanted to finish this, which is why you started, so be sure to go all the way, as you originally intended. 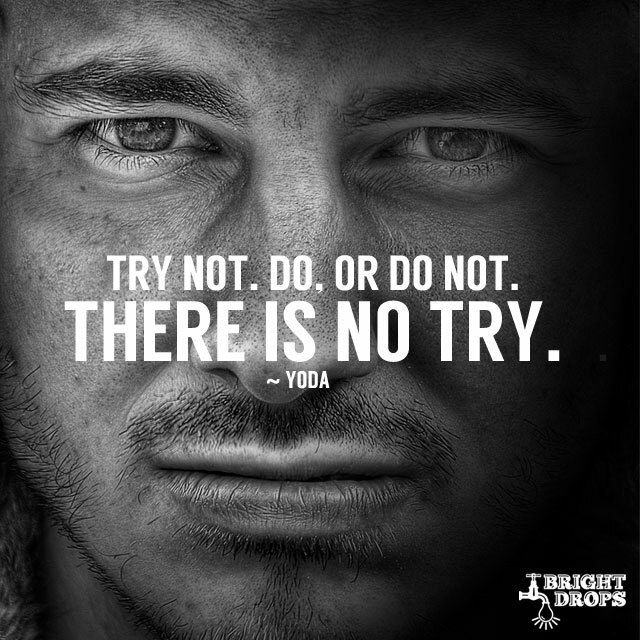 Yoda dropped one of his most famous phrases on Luke when Luke said he would try to move the sunken ship. He pointed out a very true statement. You either accomplish what you set out to do, or you don’t, there is no in between, no gray area called try. Choose to do that one thing that you’ve been “trying to do but have yet to succeed at. Feel that satisfaction that comes with knowing that you did, and that you didn’t just try, or you didn’t do not. You must unlearn what you have learned. It’s natural to want to quit in the early goings, since that’s when it is typically the hardest. But the trick is if you stay with it, you’ll learn how to get better at it, more efficient, more effective, and then you’ll become proficient at it. It’s the process of learning through doing, and if you quit too soon you never end up getting to the point where you have mastered it. Think back to times in your life when you weren’t good at something at first, but eventually got better as you went along. Even the act of tying your shoes once was a challenge, but now you don’t even think about the steps involved. 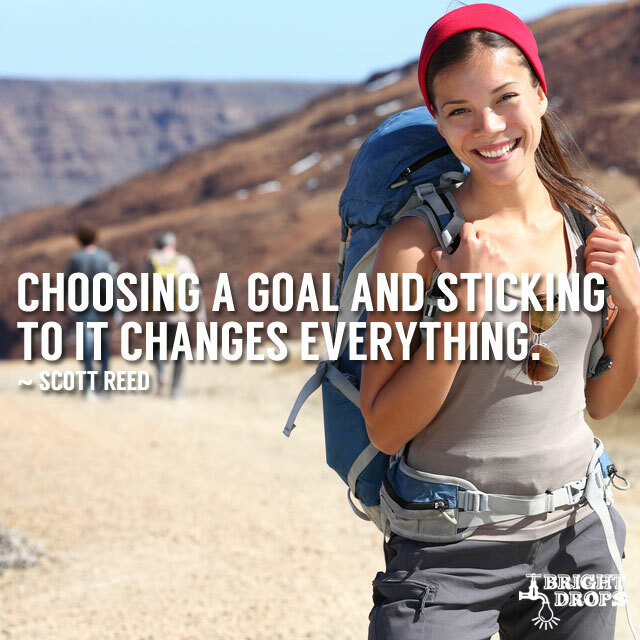 Getting a goal is not enough, you have to stick with it if you want to accomplish it. The reason that sticking to it changes everything is that it means you’ll actually achieve your goal and then you can establish your next goal from a totally different place. It’s good not to set too many goals from the place where you are now, because after achieving a few of them you’ll be in a different place, and you can make better goals from there. You don’t want to limit yourself by your current situation. Knock out a few goals first and then reevaluate what you want to do from your new place. They say you should be careful what you wish for because you just might get it. 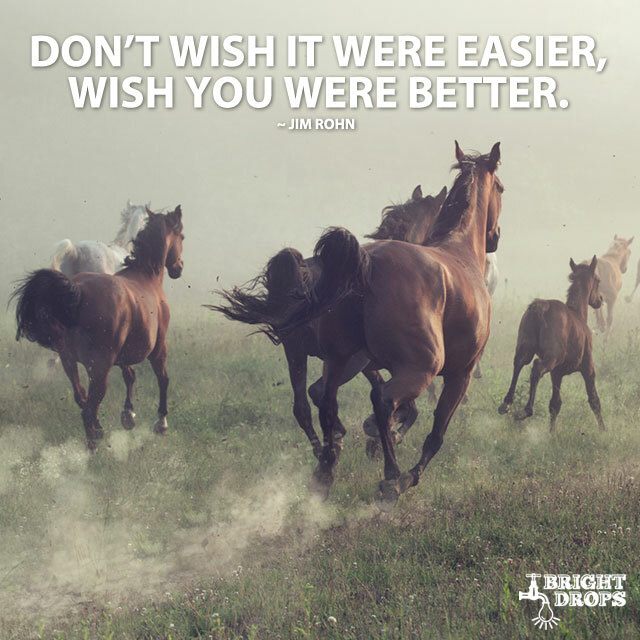 In this case if you are going to be wishing, it’s better to wish that you were better able to handle the task at hand, rather than wishing for an easier task. It’s may seem like a subtle shift, but it takes the focus off of the difficulty of what’s in front of you, and turns it inward so that you can grow to the challenge. It’s better for you to grow than for the challenge to shrink, because you always want to be improving and getting better. 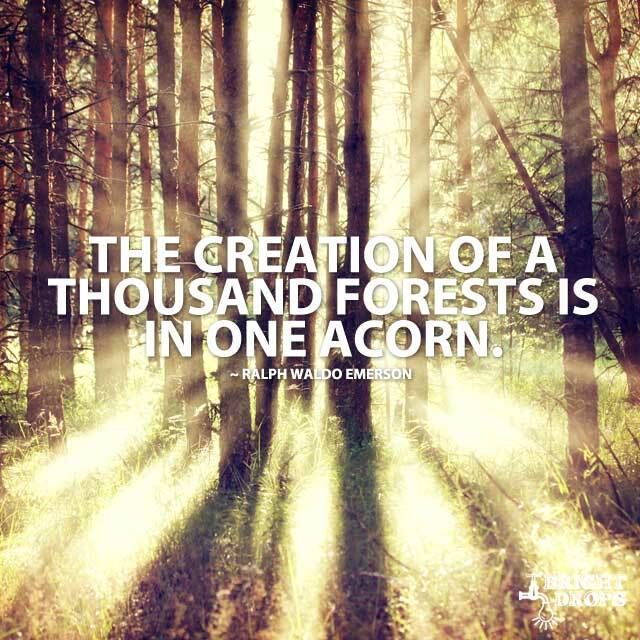 Not just the creation of a thousand forests, but thousands of wooden products like desks and chairs. That acorn has a lot to offer, so don’t be discouraged if the tasks you’re completing seem miniscule. The potential of each little thing you do is great, and can lead to big things. You can also look at your ideas as the acorn, with so much abundance locked within, all that is required is the proper nutrition to get it to grow and produce more seeds, more ideas to grow into big trees. There are many ways to look at this saying, but its core message is that big things come in small packages. 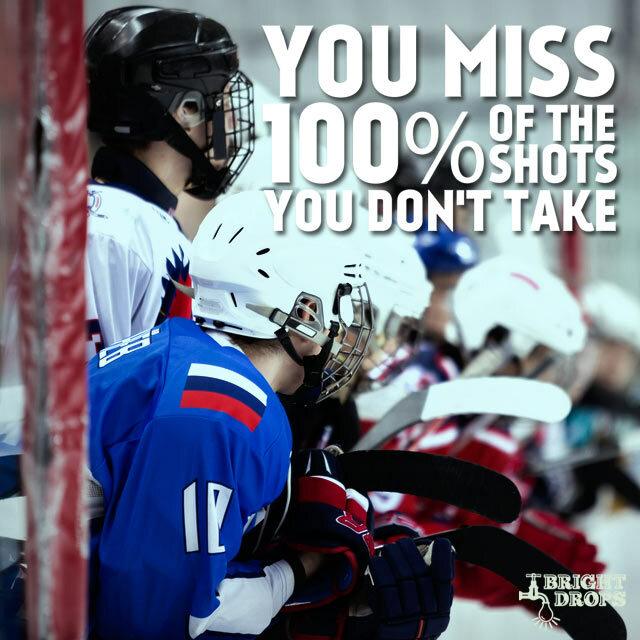 It’s true enough that you may miss a shot if you take it, but at least you took it. It’s far better than being a spectator of life, watching other people take the shots and only wishing you had the guts to get out there and give it a go. If you’re looking to get inspired to do something great you have no further to look than this quote which reminds us that it’s not very important if the shot goes in, but rather that you had the courage to get the shot off, and even more so that you were in the game to begin with. Getting knocked down is a part of life, and if you stay down you’re not going to get very far. 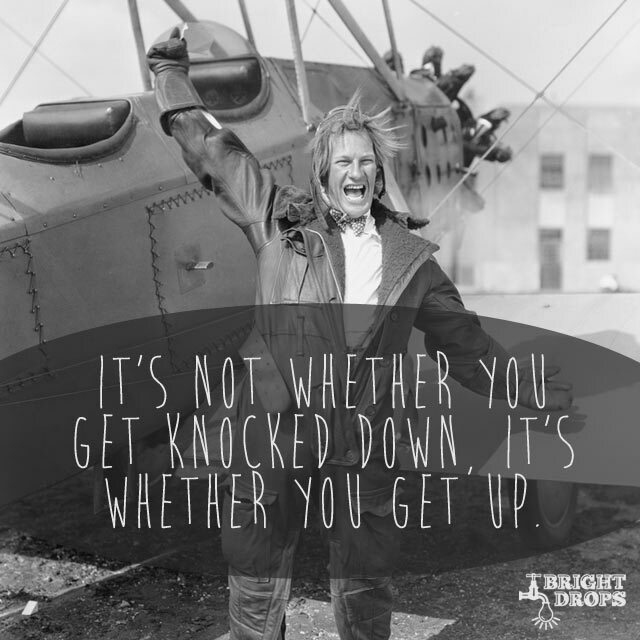 Getting back up is the key to success in all areas of life, business, finances, relationships, and health. There are surely moments in your life where you’ve been knocked down, but you found a way to pick yourself back up and carry on. Use these memories as a highlight reel to help you get back up more quickly the next time you get knocked down. It’s easy to do it again when you’ve confirmed you’ve done it before. This is an amazing quote that may sound simple but has a lot behind it. It’s saying that whatever you can dream up in this life, you can achieve. But it brings up an important element, one that many overlook. 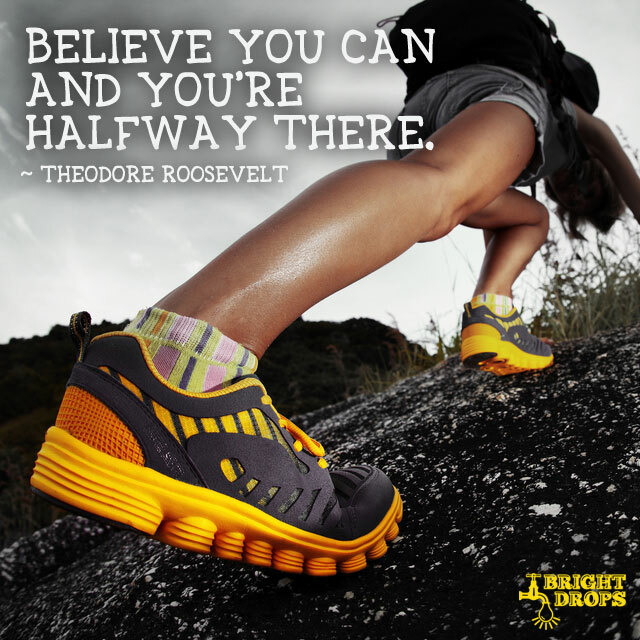 You have to believe that you can achieve it, which is the part that trips up most people. You can have a big goal, or a big dream, but if you don’t believe you deserve it, or you don’t believe you can accomplish it, you won’t. 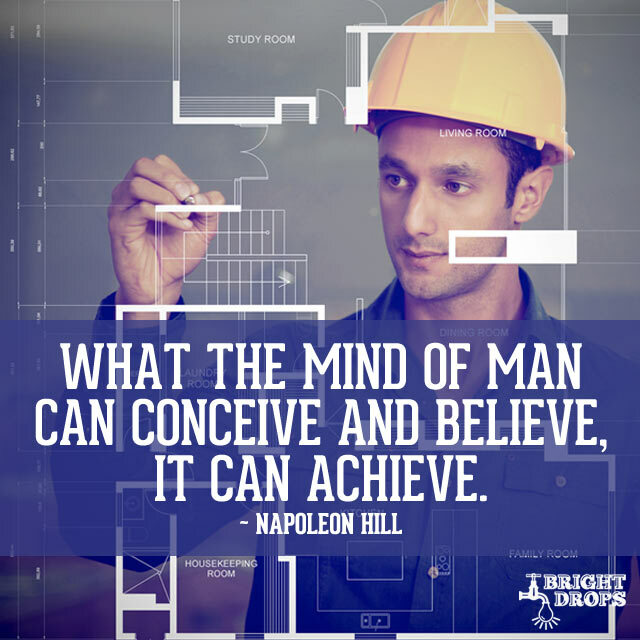 Spend equal time on building up your belief and dreaming about what you want to accomplish. Being prepared is one thing, but this quote is asking you to take it to the next level. 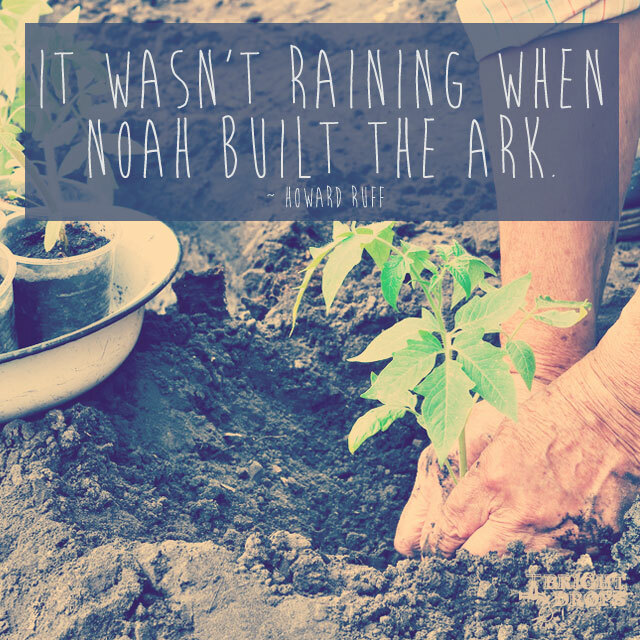 Noah was tipped off that the flood was coming, but life doesn’t always work out that way. You almost have to assume that something bad is going to happen at some point in your future, so why wait until it occurs to try to deal with it then? Prepare yourself for a disaster and if it doesn’t come even better. But if it does you’ll be able to handle it better and get through it more easily. It’s not a form of negative thinking to prepare for hardship, in fact it is a way of preserving your positive thinking even through rough times. Memories represent your past, and your dreams represent your future. The wisdom of this quote is that you should always have more planned for your future than what you’ve accomplished in the past. Getting nostalgic is one thing, but if you get to the point where you feel like your best days are behind you it can get pretty boring and desolate. Always have a dream to be working towards rather than sitting around thinking of the yesterdays gone by. Memories are still cherishable, but shouldn’t be your point of focus. Keep your eye on the future so you will always be creating new memories of great times. Thanks for compiling all these in one place, I will return often!!! Great stuff!! Keep it coming. Love this kind of wisdom. This is great! Inspirational and beautifully done. Thank you so much! A melodious collection of positive inspirational motivational quotes. These quotes are not only helpful for students but also important for young people who want to join market to get success in their life.!!!! thank you for such a good collection. !!!! Nice messages with perfect illustrations!! Thanks for such a great collection…it rejuvenates my dampened spirit…Love to see them often..
thanks alot for your inspiritional quotes .they keeep me moving. Wow! This is a goooood read! A great way to add to my own collection. the name is self-explanatory…bright drops made my life a treasure. The best collection of inspirational quotes i have ever seen. Thanks. Amazingly intriguing. This collection was, is and will continue to be really helpful to every success-driven and happiness-driven individual on this planet. God bless you for taking time to compile all these and I hope its not gonna stop just here. I will surely everyday be apart of those who would be responsible for a better world. I cant thank you enough….. you have no idea how much i needed this in my Tennis career…. one day, it will all count!!! THANK YOU!! very inspiring page, everyday i always opening it just to reflects all of those quotes and statement posted. I LOVE IT!